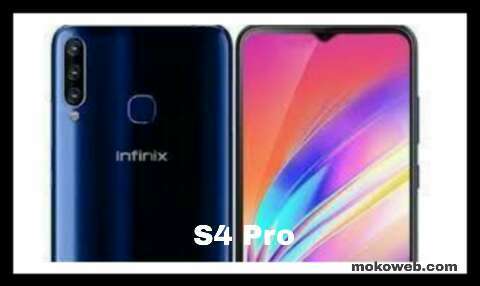 Infinix Hot S4 Pro is the bigger sibling of Hot S4 both launched yesterday April 10, 2019. The Hot S4 Pro is a top notch smartphone from Infinix Mobility featuring 6GB RAM, 64GB inbuilt Storage, Tripple rear camera, MediaTek MT6762 Helio P22 SoC processor, 6.26-inch IPS LCD display, 4000mAh Battery and lots more. The device also comes with the latest Bluetooth v5.0, Android 9 Pie, dedicated MicroSD card slot, dual nano SIM support and an amazing 32 megapixels front selfie camera. This phone is definitely going to be one of the trending smartphones of 2019 in some developing countries in Asia, Middle East and Africa. Watch out! 4,000mAh non-removable battery with fast charging technology. See a review of the rest of the specs below. Infinix Hot S4 Pro sports a 6.26-inch IPS LCD display with a 720 x 1520 pixel screen resolution. It has a decent screen-to-body ratio with little bezels left while at the top, there is a water-drop notch front-facing camera and a chin at the bottom. The back of this phone is made with glass material and the Tripple camera setup embedded with LED flash alongside a fingerprint sensor which is used to unlock the phone. Both Infinix Hot S4 and Infinix Hot S4 Pro shares same colour options – Red, black & Blue. Like I said earlier, there is also a dual SIM card slot and a dedicated MicroSD card slot for additional storage space. Infinix Hot S4 Pro packs a triple camera setup just like the Hot S4. There is a main 13MP shooter alongside a secondary 8MP and 2MP cameras. It also features four LED flash to give you the brightest photographs even in the darkest areas. The camera can shoot 1080p videos at 30fps, Same with the single front-facing 32MP selfie camera at the notch up top. There is an AI technology in the selfie camera for better selfies and better Face Recognition for the Face Unlock feature. With a processor like the MediaTek Helio P22 SoC and an octa-core processor clocked at 2.0GHz paired with an IMG PowerVR GE8320 GPU under the hood, this phone performs fantastically with no atom of lagging. It’s also good for gaming. The 6GB of RAM makes gaming and multitasking fluid and beautiful. The phone runs Infinix’s XOS 4.0 Honeybee out of the box which is based on the latest Android Operating System – Android 9.0 Pie. Infinix Hot S4 Pro is powered by a 4,000mAh battery with a fast Charging capabilities. It shares the same battery specs and features with its sibling – the Hot S4. The phone is charged through its micro USB port which also doubles as file transfer port. There is also 4G LTE connectivity, WiFi, WiFi hotspot, WiFi direct, Bluetooth, GPS, FM radio and the ageing 3.5mm jack. The global price of Infinix Hot S4 Pro is $180 if you are ordering online but in Nigeria, it’s priced at just N64,500. Watch Infinix Hot S4 Pro review & unveiling video below. Infinix Hot S4 Pro is definitely a very good phone at a cheap price. The specs meets up with latest 2019 trends and I advise you to consider this device as your next phone. What do you think?